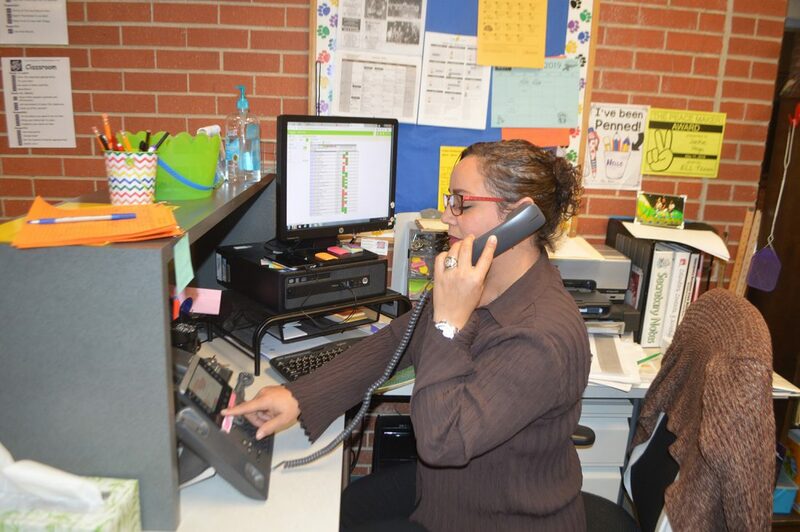 T-R PHOTO BY ADAM SODDERS - Fisher Elementary School secretary Jackie Vega uses one of the new phone units the Marshalltown School District approved in June. The previous phone system units are set to be sold online. Old equipment may find new life outside of the Marshalltown Community School District. A public hearing on selling retired phone equipment was held at this week’s school board meeting. It came and went without objection by any member of the public. The older system was replaced this summer when the school board approved a bid from Heartland Business Systems to put in a new phone system at a price of $262,000 over five years. At the time, Wesley said the old phone system proved problematic. For instance, he said it was hard to find replacement parts for faulty equipment. For reliable communications, Wesley recommended the upgrade. The new system includes more modern features, such as allowing callers to direct-dial a specific staff member or administrator they want to speak to. Previously, a secretary would have to transfer callers to the person they wanted to talk to. The new phone equipment purchase came as part of a larger effort to upgrade technology at the district. Other measures that have been approved in recent years are a new firewall system, the purchase of new chromebooks, an upgraded audio-visual system for the school board meeting room and more. Monday’s public hearing wasn’t the first time the district showed interest in selling old equipment. A similar hearing was held over the sale of some older Dell and Acer chromebooks in October 2018. Wesley said the department of technology had brought in about $36,000 from the sale of old tech equipment in 2017. No action was taken by the board on the sale of the old equipment. The public hearing was a required step in the process of putting the equipment up for sale.